Haldankar Customs has built Custom ST350 abbreviated as ‘Scrambler-Tracker 350’. 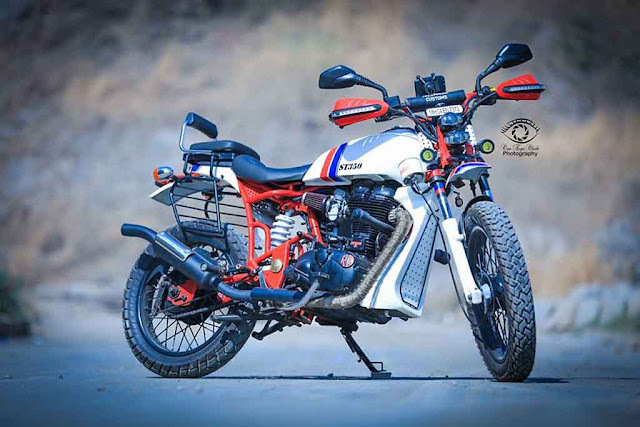 It is first tracker come scrambler made out of Royal Enfield Electra designed to rule all terrains. 2. Motorcycle height can be reduced by 6 inches. As the bike have adjustable front and rear suspension. Through this bike can convert from off-roader to a fast mover. 3.It has two different rear seats one fits underneath the carrier for scrambler look and other fit on the top of the carrier for double seat on off road. 4.Front 19 inch rim and rear 18 inch rim with superb grip all terrain tires. 5.LED lights projector and SPOT fog lamps are fitted for the better visibility and atmosphere. 6.Unique indicator come lever protectors on handlebar. 7.Waterproof GPS system which has updated map of india to travel anywhere and it also has many multimedia functions for entertainment. 8.It has waterproof mobile charging facility. 9.Performance upgrades done for better performance while travelling long distances.